1. Remove the old cache aerator. Take the appropriate aerator wrench and line it up with the grooves for the cache aerator in your faucet. Gently push the wrench into the aerators grooves and turn the wrench counter-clockwise (to the left) to loosen the aerator. You should feel the aerator insert start to loosen. Keep rotating the wrench counter-clockwise until the aerator comes free from the faucet. Having trouble removing the aerator using the wrench? It could be that debris behind the aerator has caked it into place. 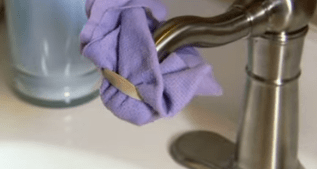 Simply take a spare rag, soak it in white vinegar and rubber band it around tip of the faucet. Let it sit for about 10-15 minutes before coming back to it. By that point the vinegar should have helped to loosen the debris from around the aerator. 2. Insert the new high efficiency cache aerator. Take your new, high efficiency aerator, line it up with the faucet and gently push the aerator into the fixture using the aerator wrench. Now, gently turn the wrench clockwise (to the right) until you feel the aerator snug into place. 3. 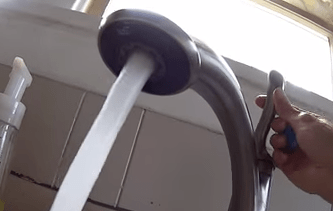 Test your faucet to ensure it’s working properly. Now that you’ve installed your new high efficiency faucet aerator all that’s left is to test it out. Simply turn on the water and make sure that your faucet is working properly. If water isn’t flowing properly it’s likely that the new aerator isn’t aligned correctly. 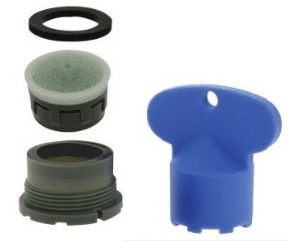 Simply remove the aerator and try re-installing it. 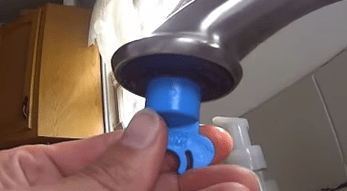 There could be debris logged into the grooves of the faucet, if so, take a rag and remove the debris before attempting to re-install the aerator. If you’re looking for more ways to make your home both water and energy efficient, be sure to check out our green home improvement projects: Green Living Ideas, after all, is a top 20 home improvement website! Photos courtesy of Conservation Warehouse, Delta Faucet and Pono Home.